It is expected that all users of the St. Mary’s College of Maryland Web site will comply with applicable copyright laws. However, if St. Mary’s College of Maryland is notified of claimed copyright infringement, or otherwise becomes aware of facts and circumstances from which infringement is apparent, it will respond expeditiously by removing, or disabling access to, the material that is claimed to be infringing or to be the subject of infringing activity. 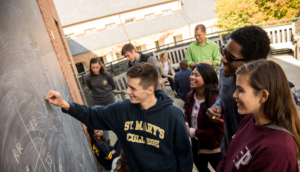 St. Mary’s College of Maryland will comply with the appropriate provisions of the DMCA in the event a counter notification is received by its designated agent.